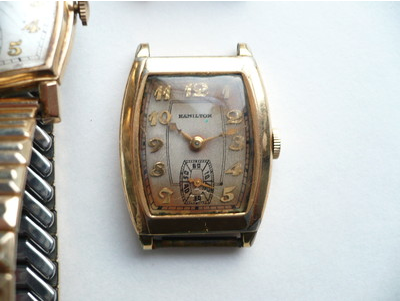 Hamilton produced a lot of "masonic" watches targeted for members of Freemasonry. These watches have masonic symbols as hour markers on the dial and even show up as options in the catalogs. However, there is only on watch model called the Mason - and I don't believe there was any intended association with Freemasonry. It was produced for only one year - 1935 so you won't come across them very often. 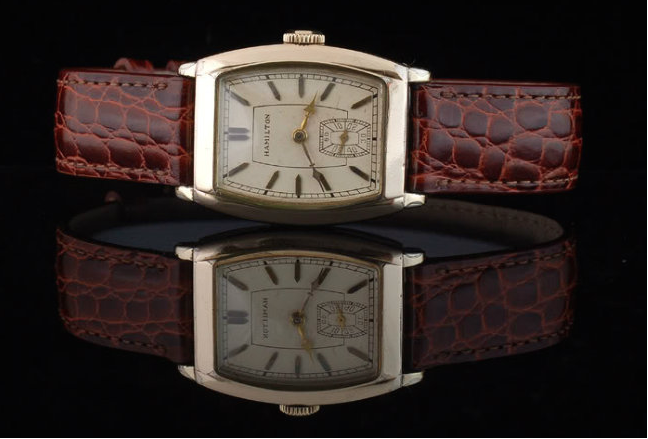 Being manufactured only in 1935 you are most likely to find a 6/0 sized, 17 jewel 987F movement under the hood as the 987E with the "Elinvar" hairspring was introduced the following year. The gold filled case came in yellow or white. Three dials are shown as available in the catalog... a black enamel dial, a luminous dial, or an applied gold numeral dial. 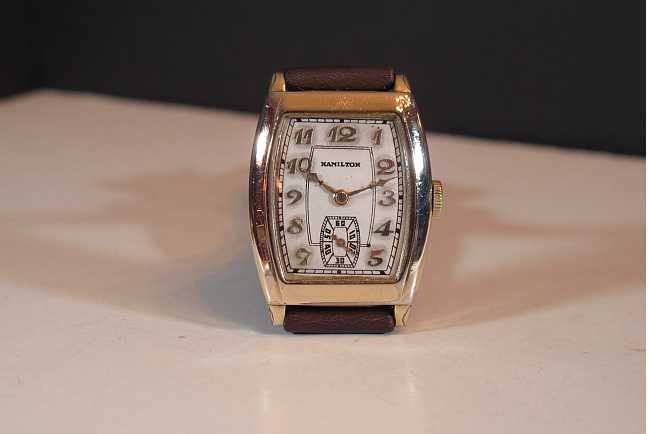 However, as you'll see in one of the photo's below, an applied gold marker dial was also an available option. They made about 9,300 yellow versions and only approximately 1,000 white versions - so the white Masons are very scarce. I think the Mason looks a lot like the Gladstone, which was discontinued the prior year, 1934. The best way to tell them apart is the Gladstone has a rectangular crystal and minute track, while the Mason's crystal and minute track is more barrel shaped. Also, the Mason does not have an engraved center case, where the Gladstone does. On the similarity side, like the Gladstone, the Mason is prone to wear through on the outer edges of the lugs and on the bezel near the corners of the crystal. You can search for the Gladstone in the search box in the menu on the right. I've only come across one Mason in my collecting experience and I was able to nab it for a pretty good deal since it was in somewhat scary shape. I was able to clean the dial up fairly well and I think it's actually an old, but quality, refinished dial. The main tell is the doubled track inside the numerals - it should only be a single track. Someday I will get it redone to it's proper standards. Here's a nice shot of the uncatalogued marker dial courtesy of fellow Hamilton enthusiast, Tom Diss. If you've got well trained eyes for detail you might notice the wrong style hour and second hands. This is surprisingly common and I think watchmakers over time often substituted whatever was "close enough" when there was a problem with the original hand. 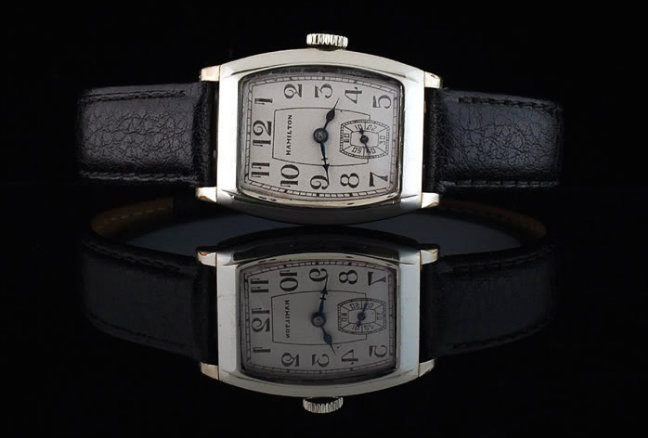 And here's a nice example of a white Mason with black enamel dial from Tom's collection. This one also has mismatched hands and only the second hand is the correct "solid diamond" style for a Mason. Some people are purists and expect all the hands to match the original catalog design. Personally, I think whatever hands are on the watch when you become it's present-day caretaker are just a part of the overall character of the watch and a part of it's history. I'd still probably change them back though, if I had the correct style laying around.